This accomplished range of anaerobics contains Thread-Lockers, Thread-Sealers, Retainers and Pipe-Sealants. All of our anaerobics are manufactured in strict accordance with an ISO 9002 accredited quality system and many have gained MIL-S-46163A, ASTM D-5363 and NSF approvals. The word "Anerobic" means without air, which explains the primary cure mechanism of this group of adhesives. An Anerobic Adhesive is a single part adhesive that cures or polymerizes when deprived of oxygen. 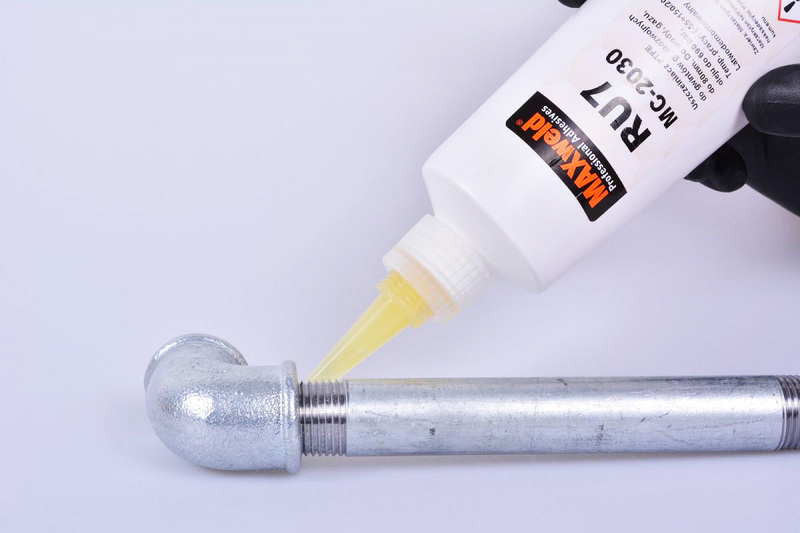 Anaerobics are designed to lock and seal metal components and fasteners and are available in a range of viscosities, from water-thin to a heavy paste. An anaerobic is normally made from an acrylic monomer that contains a replenishing supply of free radicals which react with oxygen in the air, allowing the monomer to stay in a liquid form. When pressed between two surfaces the oxygen is restricted and the free radicals are forced to react with the carbon molecules of the monomer itself, forming a polymer group or chain and turning the monomer into a solid. This reaction is quickened with the introduction of a metal, which fuels and increases the production of free radical catalysts. High Strength Retaining Compound resistant to dynamic load. High Temperature Retaining Compound for fiited parts and threads. High Temperature Flange Sealant, Chemical resistance. Flexible Gasket Maker. Does not drip off vertical surfaces. MCPOLSKA.PL Sp. z o.o. S.k. Copyrights © 2017 MaxWeld. Wszelkie prawa zastrzeżone.